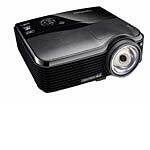 The PJD7383i is an advanced short throw DLP projector which includes BrilliantColor technology to produce more vibrant colors, while the high brightness and contrast ratios make this projector shine in virtually any lighting situation. The PJD7383i delivers 3000 lumens with a 1024 x 768 XGA native resolution. Priced at just a fraction of the cost of a traditional 77” interactive white board, the ViewSonic iProjector provides ultimate flexibility for interactive learning.